Gotham is the type of place that really brings out the crazies. For some of the denizens of the gothic city, that is pretty cut and dry. PERSON shows up on the streets and is dressed in bizarre attire and then proceeds to talk for a long while, saying ridiculous things, possibly to themselves, and then begins blowing up chunks of the city or killing random civilians or threatening (or even succeeding) in spreading a mind-effecting toxin into the atmosphere. We all pretty clearly understand that this character is a crazy villain and needs to be shut down, post-haste! But, most of the other Gotham natives are a little harder to pin down. Heck, when even your primary protagonist is, himself, a bit of an anti-hero, who can be surprised when folks like Catwoman shows up who moonlights as a hero or Harley or the Joker even go on a few anti-villain sort of quests for the Suicide Squad? And, speaking of the Joker, whew!? Trying to pin down that guy’s back story is about as easy as doing calculus through a mirror and underwater! Is he a genius villain in total control of his mind? Is he a mad serial killer too far gone? Or are the truths of the Red Hood to be believed? Could he have started out a tech-bolstered thief who became a victim of a corrupting toxin? If so, what about these rumors of a new Red Hood wandering the streets and cleaning up crime? Could the Joker be moonlighting, too!? Who can answer those questions!? 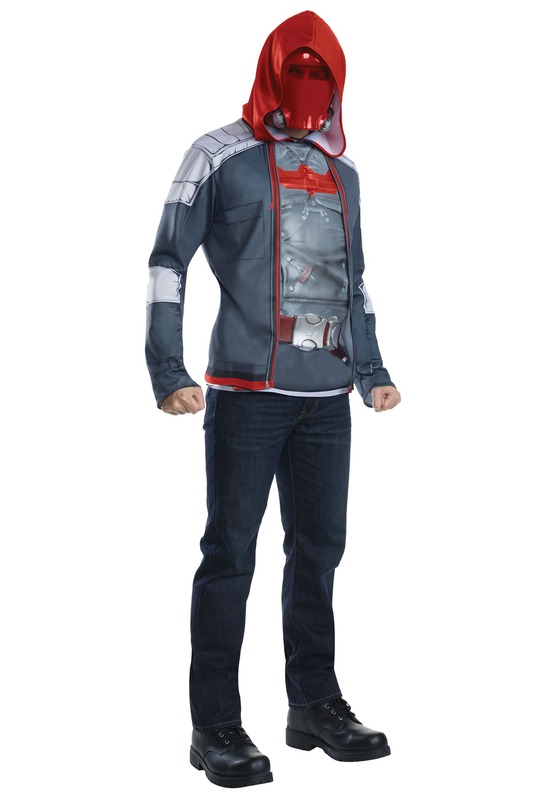 Well, we can get a little closer with your help, thanks to this Adult Red Hood costume. The polyester pullover shirt and attached jacket are a keen fit and have fantastic faux-metal looks along the chest, along with the slightly corrupted look of a red-tinted bat symbol. The mask has elastic bands for easy wear and the belt ties in back for the complete look. Will you prove the Red Hood to be a pre-monstrous Joker or might this be the second Robin, Jason Todd, turned truly dark? Only time will tell, though bad guys better beware either way!